This article presents a scientific overview of the basic implementation of the principles of ecological engineer ing in watershed management. The next two sections discuss the landscape factors of nutrient fluxes and the critical source areas in rural watersheds. 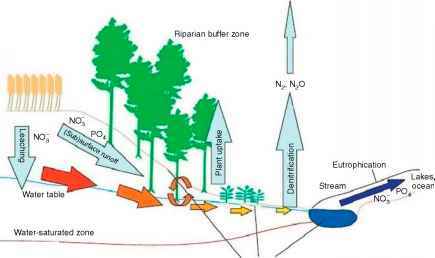 The subsequent sections give an overview of the principles, role, and efficiency of the main ecotechnological measures used in watershed management: (1) riparian buffer zones and buffer strips and (2) constructed wetlands (CWs) for was tewater treatment. Examples of the design criteria, efficiency calculation, and application efficiency of these two measures, as well as case studies on the application of ecotechnological measures in watershed management in various regions, have been considered.